Alchemilla is a fantastic new addition to the Glasgow food scene. 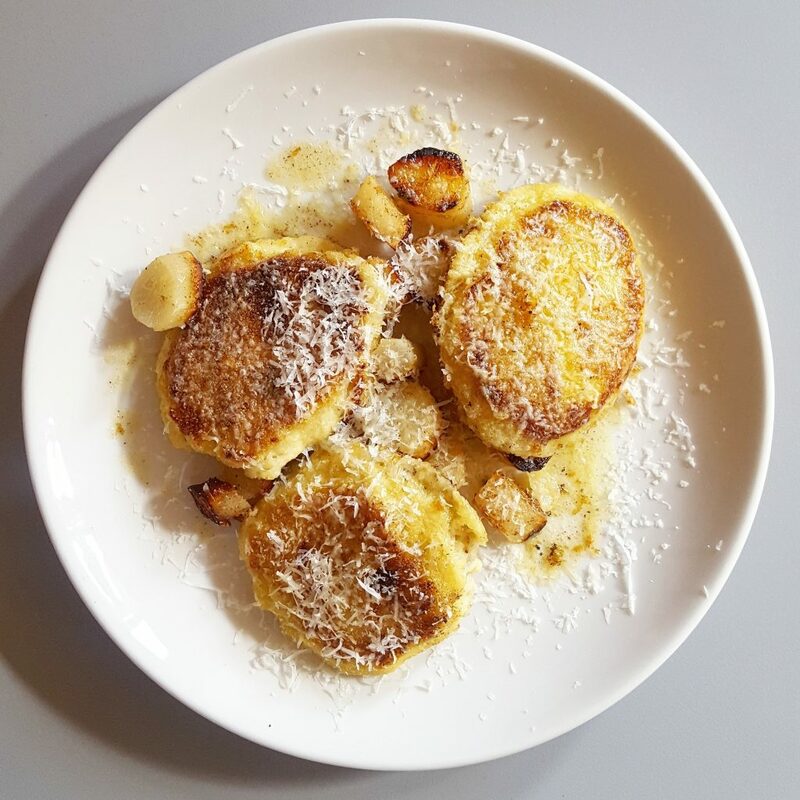 It launched in Finnieston, in the West End of the city in October 2016 by Fergus McVicar (Chinaski’s, The Berkeley Suite and Tabac), who has brought in the very talented Rosie Healey (Ottolenghi and Jago) to head up the kitchen. Many fragile fish can become rubbery or dissolve in lemon juice but sea bass stands up to the acidity while retaining its delicate flavour and texture. The sea bass was fresh, tasty and firm; the lemon juice and zest made my taste buds ‘zing’ and the addition of thyme was simply glorious. The gnocchi romana with salsify (£6)…ridiculously delicious light and fluffy pillows of soft potato with a delicate crust, teamed with the sweet and slightly nutty salsify was a delicious combination. Perfect comfort food. 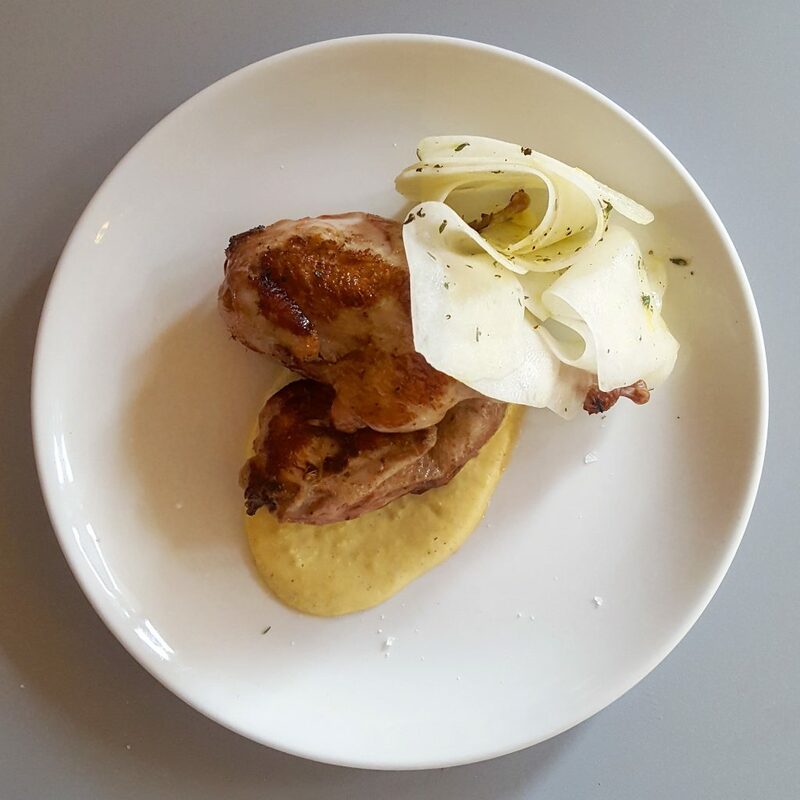 The roast quail was deliciously sweet and tender and perfectly paired with a smooth hazelnut sauce and fresh, crunchy kohlrabi gave it some beautiful texture. (£8.95). 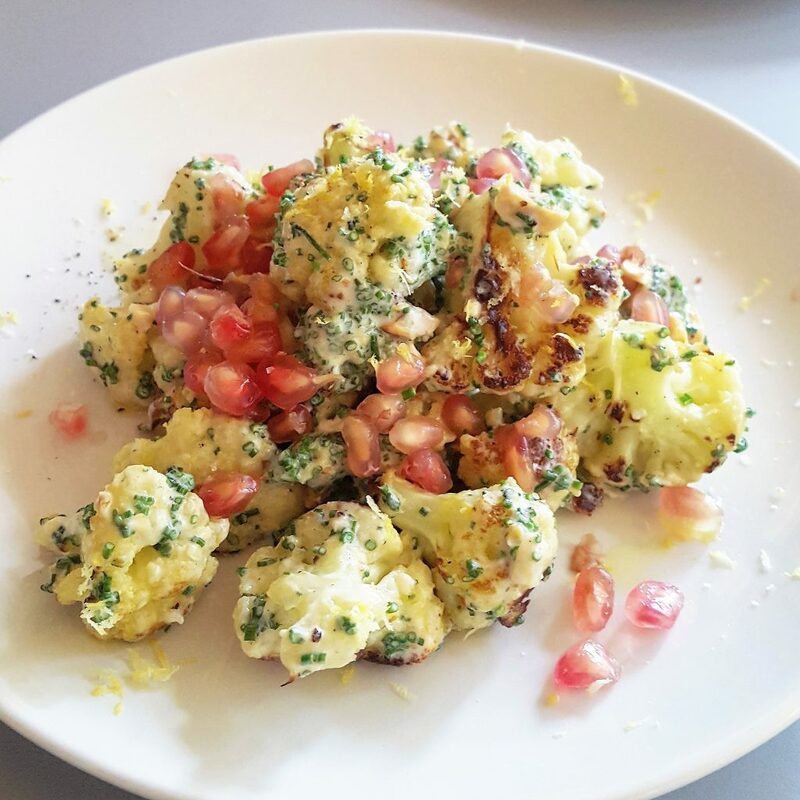 The roast cauliflower with tahini and hazelnuts and pomegranate seeds was another triumph. (£4.95). The nuttiness and richness of the tahini worked beautifully with the charred pieces of cauliflower and the pomegrante cut through with sweet freshness. 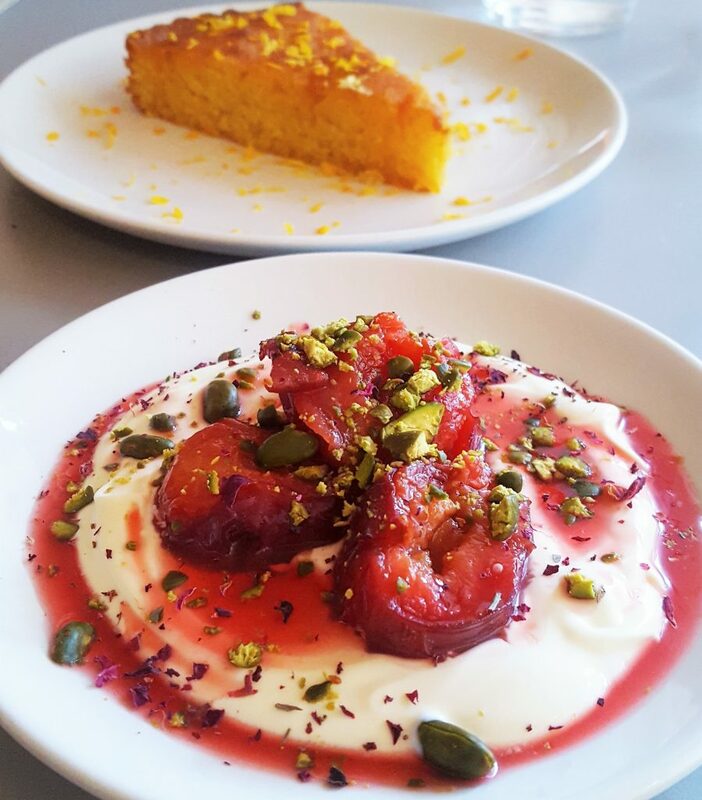 Sweet, juicy, sticky sumptuous plums on a bed of sharp, creamy crème fraîche and pistachios adding some much needed texture. Absolutely delicious and the perfect end to a large meal as it gave my tastebuds some sweetness without any heaviness. The orange polenta cake which was unbelievably delicious, moist and citrusy. 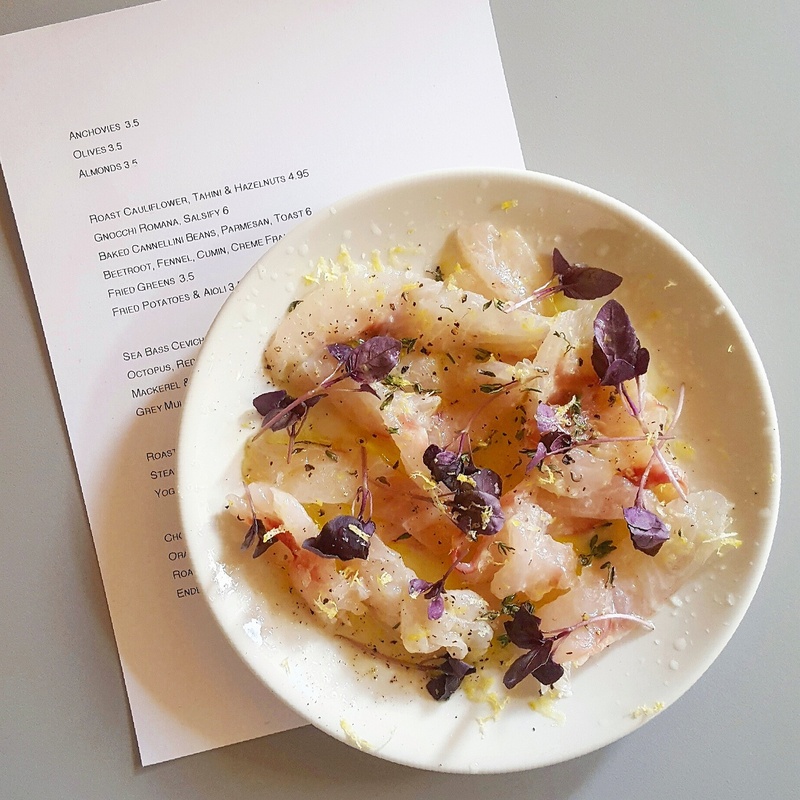 The food at Alchemilla is stunning, both in flavour and presentation. The service was spot on…very friendly, smiley and knowledgable. The menu changes constantly so there is always a good excuse to head back for more!